David Dell is a researcher living in Nicaragua, studing the Cornelius Vanderbilts boats that sailed the Rio San Juan River in Nicaragua from 1851 onward. He is particularly interested in the "San Francisco" that Mark Twain sailed on in late 1866 and early 1867. He has located the wrecks of three boats and one that still has much of the boiler and some intact hull. He plans to make a documentary about the steamboats of Nicaragua. 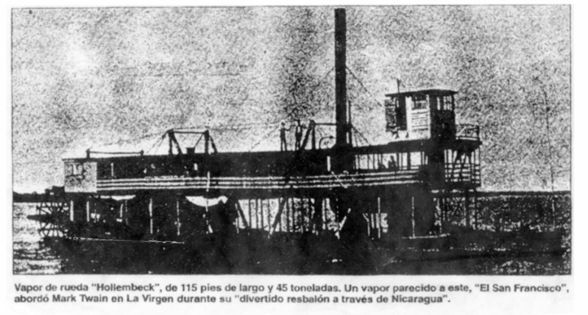 "The first steam ship to enter lake Nicaragua was called the 'Director.' It was owned and piloted on this trip by Cornelius Vanderbilt himself. The Director weighed 120 tons and carried 400 passengers. 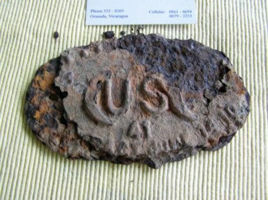 it arrived off the Lake Nicaragua city of Granada on January 1st 1851." 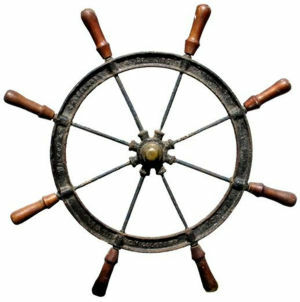 "One other item we have a steering wheel from the same period and the name of the manaufacturer appears to be Wilcox & Crittenden, or something very similar. Manaufactured in Middletown Connecticut." "This is a picture of the Hollembeck, which is the sister ship to Mark Twain's San Francisco. She is 45 tons in weight and 115 feet long; the time period is around 1860 onwards." 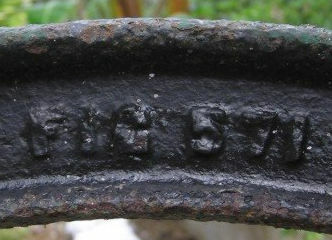 Below: an old wheel. 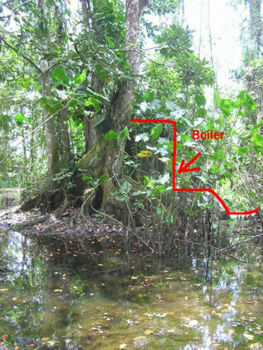 "We are just about to research a steamboat that is in the jungle 100 yards from the river. This is fairly well preserved, at least the boiler and part of the hull. I am in contact with the Middeltown Press newspaper in Connecticut as they had the factory there that made the steering wheel and possibly the boilers." "We are hoping to find a steamboat called the "DIRECTOR" it was bought by Cornelius Vanderbilt and was the first steamboat to cross lake Nicaragua. It is listed in the Lytle-Holdcamper list but that doesn't give many details. Do you have any further information on it. It was built about 1850 for Cornelius Vanderbilt. 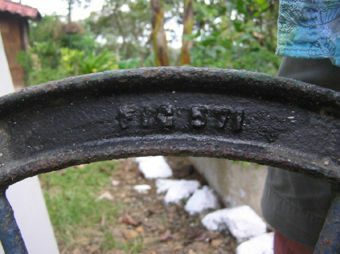 "In 1852 Vanderbilt also bought other steamers called OMETEPE, CENTRAL AMERICA, JOHN M. CLAYTON, and EDMUND D. MILLER. Is there any info on these? "What I can't seem to find on the internet is specific information on boiler constrcution. "Most of the wrecks have little left but the boiler and exact measurements could give a clue as to their identity." I really appreciated seeing the information on Steamboats of Nicaragua. My husband has an ancestor who may well have traveled on one of them in 1853. Lewis Francis Beers went overland from Ohio in 1852 to the California Gold Rush. He returned, family lore said, by ship to New York and then walked back to Ohio. (I think of this any time my own travel develops difficulties.) His wife died while he was gone, leaving three small children. He's back in Ohio by January 1854, when he marries wife #2. He kept a diary on the way out, but not on the way back. Had a friend search for his arrival in NY using Ancestry.com's immigration database and found an L. F. Beers arriving 28 Oct. 1853 from San Juan del Norte, Nicaragua, traveling U.S to U.S. 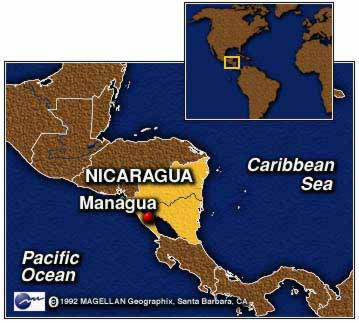 This was my introduction to this route through Nicaragua. Although your photo of the Hollembeck is from a few years later, it still gave me a sense of roughly the time when Beers would have been there. All this is intriguing enough to encourage me to look into the feasibility of retracing the route across Nicaragua. What an experience it must have been.